Many mentions the problem of the noise, because it is true that the first wind mills whistled and squeaked. But the new models are equipped with quiet gears. The blades are more aerodynamic, to let pass the wind. Moreover, they now have the capacity to transmit the sounds towards the nacelle, which is now upholstered. Result : produced noise reached 45 dB with 300 meters. In comparison, it is less noise than a computer works from there (approximately 60-80 dB) and the noise is completely masked by a wind of 8meters/s. Are the wind mills birds'enemys ? No, because in France their positioning is very regulated. It holds account at the same time roads of migration and nests. 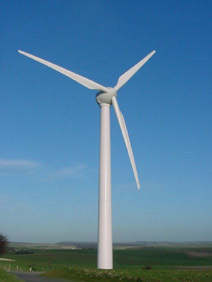 A study of the LPO (league for birds' protection) showed that a wind mill keep silent 0,4 to 1,3 bird every year. It is less than one car, or even a pane ! An expensive energy ? 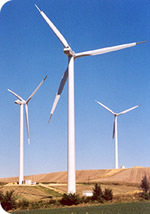 The wind mills are one of the rare sources of energy which almost do not require a human intervention. They function completely automatically, the only costs of operation are the regular inspections. Even construction is less expensive. A park of 10 000 MW costs 10 billion euros, that is to say 1 euro per Watt. Future engine EPR, a pressurized water reactor, costs 4 billion euros for 1600 MW, that is to say 2 to 3 euros per Watt. Dangerous machines ? 40 000 MW are installed in the world, and one deplores only one accident (in France in 2004), which didn't kill anybody. A study of Denmark (third European park) gives an accident's probability in one year of 0,00083 ! The wind mills are designed today to resist winds of 180 km/h, and the cyclonic areas choose dismountable wind mills.